Laserfiche integrates business process management and enterprise content management more tightly. It adds significant capabilities for automating business processes and gives organizations the management tools they need to make smarter decisions about the way knowledge work is carried out. 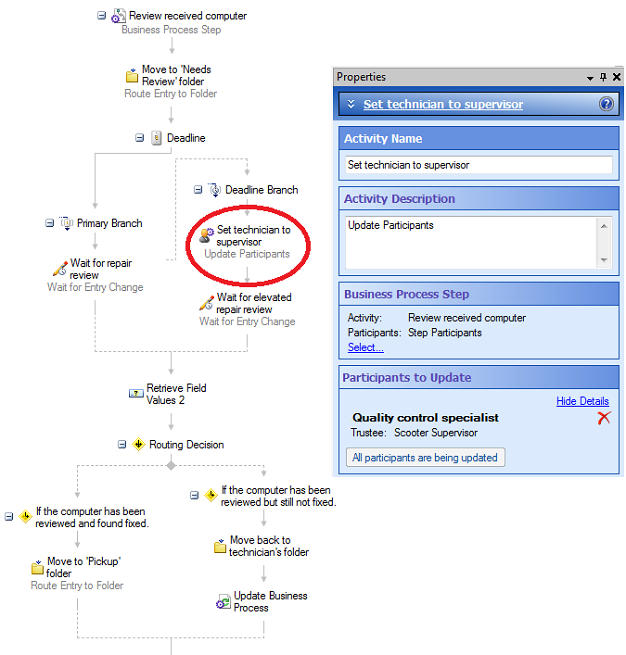 Laserfiche Workflow utilizes business processes — or “super workflows.” This article outlines how to design a simple business process using Laserfiche Workflow. A customer brings a broken computer to the shop. A secretary checks the computer in, fills out a special repair request form and takes photos of the computer. All of this documentation is stored in a newly created folder. The secretary then places a sticker on the computer with a Repair Request Number on it, assigns a technician to the repair and passes the broken computer and its folder to that technician. The technician fixes the computer, and then passes it on to the quality control specialist. The quality control specialist has two days to review the computer to make sure that it is completely repaired and then approves the repair. If the computer is not reviewed during that time period, the quality control supervisor must review and approve/deny the computer. The secretary, notified of the repair status, contacts the customer to pick up the computer. 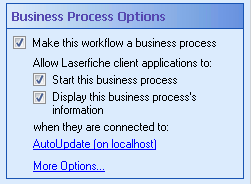 Here is how we have fully automated this process with Laserfiche business processes. 1. When a customer brings a broken computer into the shop, the secretary checks in the computer and fills out an online Laserfiche Form with details regarding the customer and the repair. The secretary also takes photos of the computer and attaches them to the form. 2. 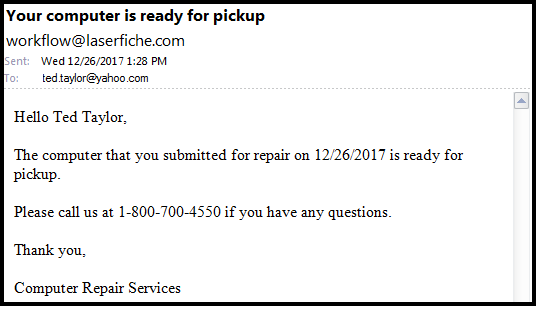 As soon as the form is submitted, it is sent to the Laserfiche repository along with the attached photos and converted to PDF, with the “Repair Order” template automatically assigned and metadata filled out. 3. 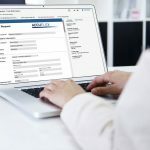 Both the form and photos are stored inside a new customer folder, which is filed in the “01 Initial Submission” folder in the Laserfiche repository. 4. The secretary does not want this process to start until the unit is prepared for repair and the correct sticker is placed on the computer. 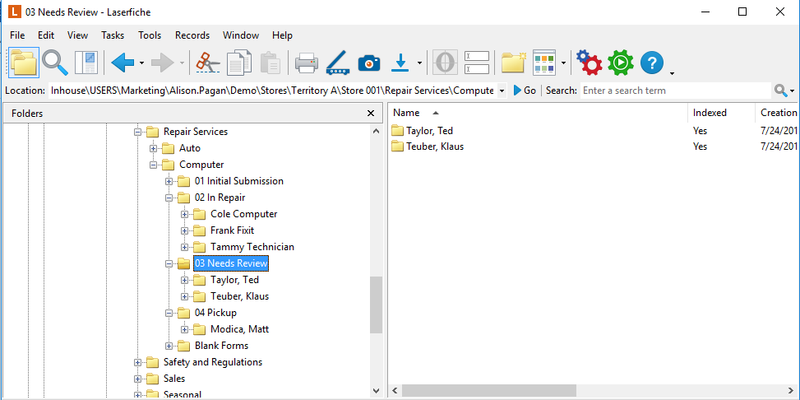 He ensures everything is in place and manually initiates the Computer Repair business process on the repair request folder by clicking a button in the toolbar. 5. 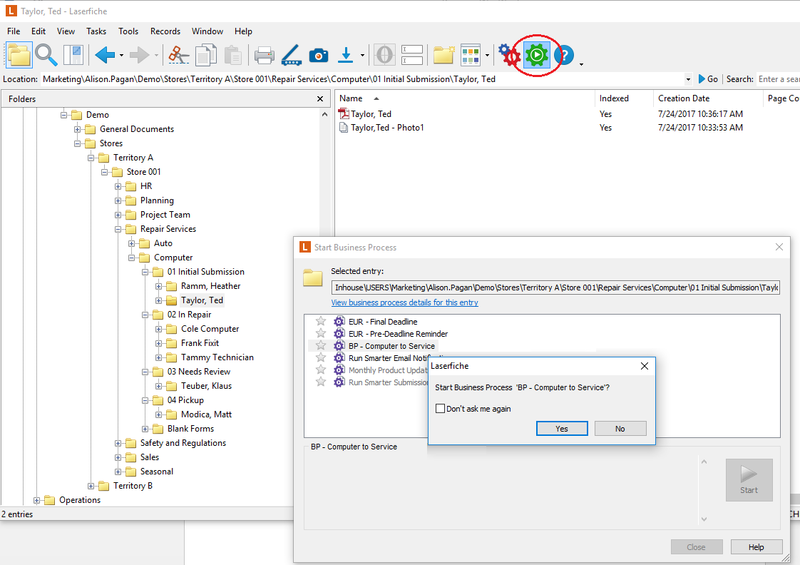 Laserfiche Workflow routes the client folder to the assigned technician’s folder. In this case, Tammy Technician’s folder. Tammy will get a daily e-mail with a list of any computers in her work queue. 6. 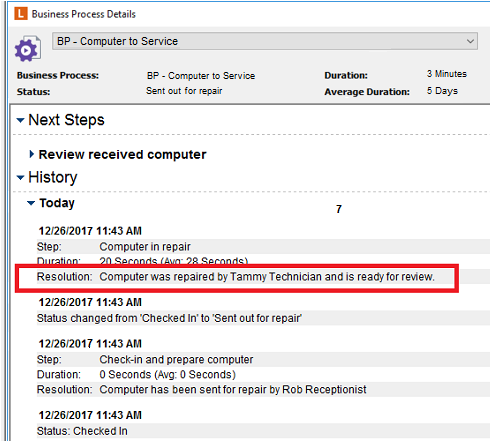 Once Tammy Technician fixes the computer, she updates the “Repair Notes” field and changes the value of the “Computer Status” field to “Requires Review.” Workflow then routes this folder to the “03 Needs Review” folder. 7. The quality control specialist has two days to review the computer. If he doesn’t update the “Computer Status” field to “Ready for Pickup” or “Reviewed – Not Fixed” by the deadline, then the quality control supervisor is notified by e-mail and must review the computer instead. 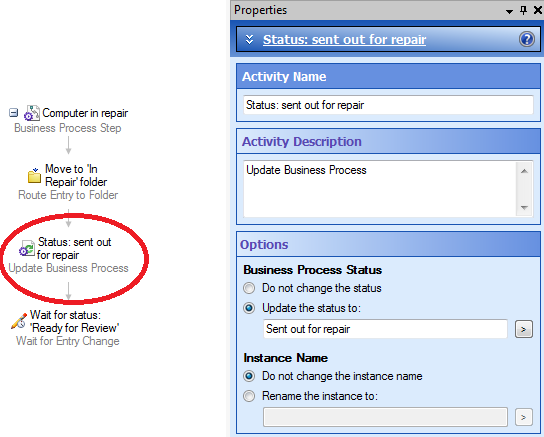 These same instructions will also show up in the Business Process Pane when the repair form is opened in the Laserfiche Windows Client or Web Client. If the quality control specialist sets the status to “Review – Not Fixed,” the computer is sent back to the repair technician for further repair. 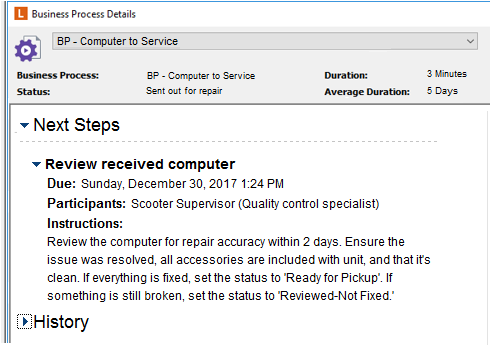 The quality control specialist can easily view the business process details on the folder to see the technician who initially repaired the computer in order to follow up with him about the incomplete repair. 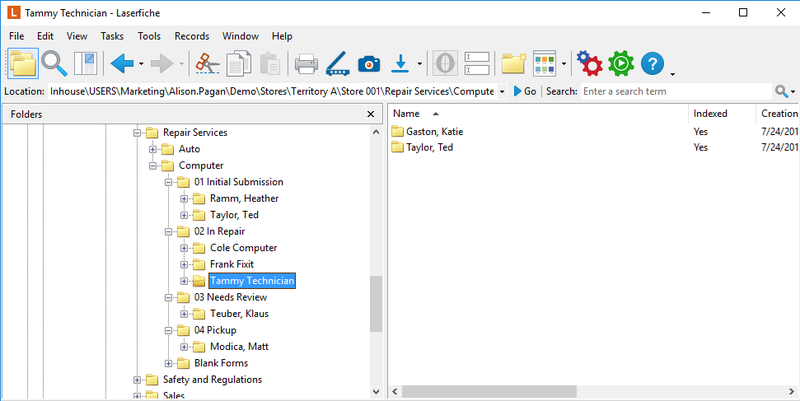 If the quality control specialist sets the status to “Ready for Pickup,” Workflow will move the client’s folder into the “04 Pickup” folder and both the customer and the secretary are automatically notified by e-mail that the computer is ready for pickup. 9. Once the computer is picked up, the secretary changes the “Repair Status” to “Complete” and Workflow routes the folder to the archives. 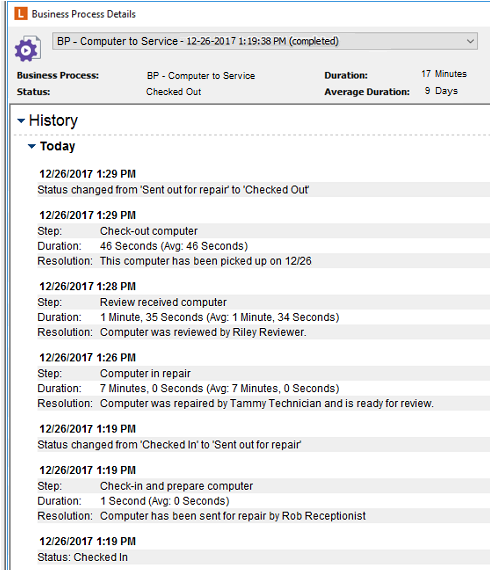 In the future, if the customer has an issue with the repair, the supervisor can quickly view the business process details to see the entire repair history of the computer in question. 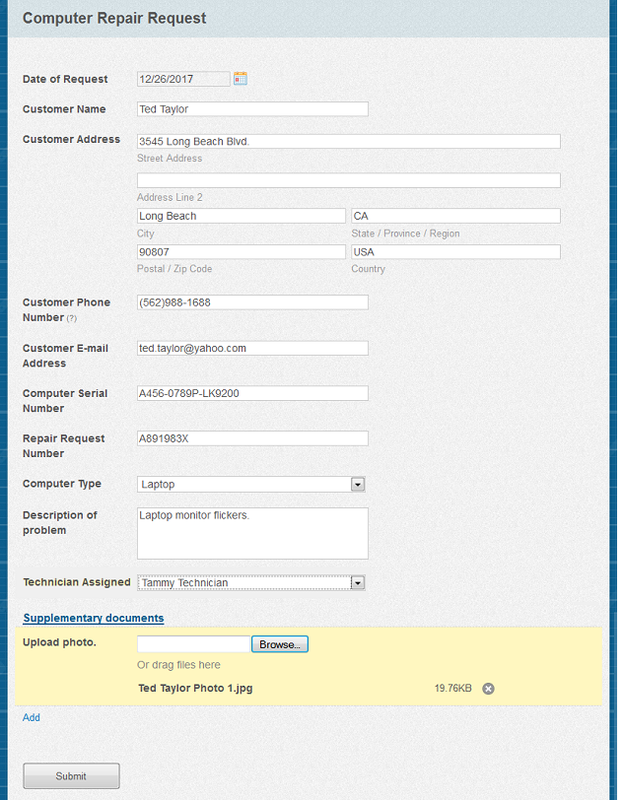 Route the submitted form and photographs into a brand new folder in Laserfiche. Extract the form field values into tokens. 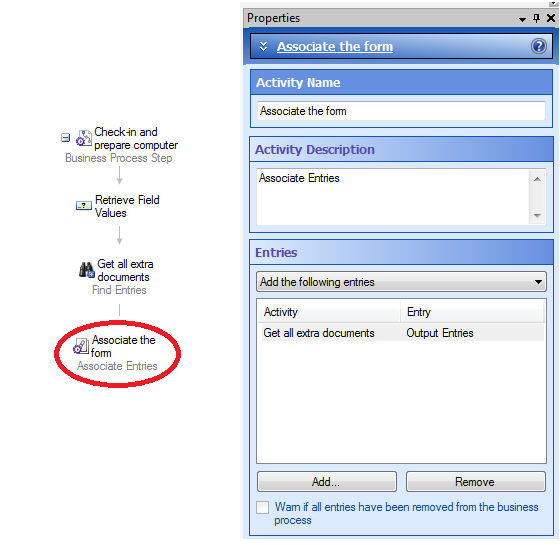 Populate the document’s, photographs’ and folder’s metadata. The second workflow will be converted into a business process so that it can be integrated with users’ daily tasks. To prevent unauthorized users from launching this business process, we’ve configured security so that only the secretary and manager can launch it. 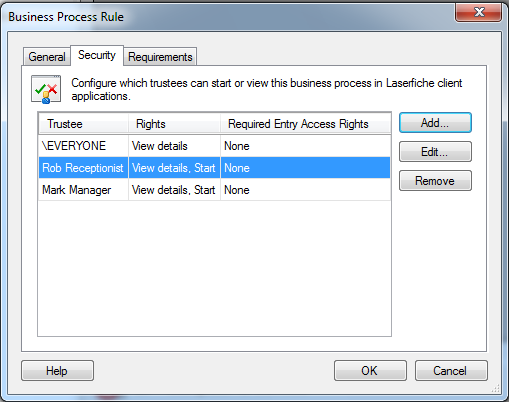 Business processes can be started directly from the Laserfiche Client or Web Access, on a schedule, or using a condition starting rule. In this case, the business process is started manually by the secretary. This business process is divided into four main steps, each of which is performed by a different person. In order to turn a workflow into a business process, check the “Make this workflow a business process” option in the Workflow Designer. The participants – the users who should take part in this business process step. The due date – a guideline for the participants of by when they should complete the required task. 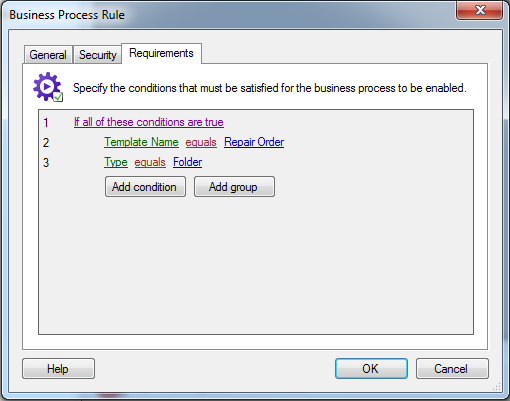 User instructions – the text that will appear in the Business Process Pane prompting the participants on what they should do in this business process step. Resolution — information displayed if the task was completed before the due date as well as after the due date. 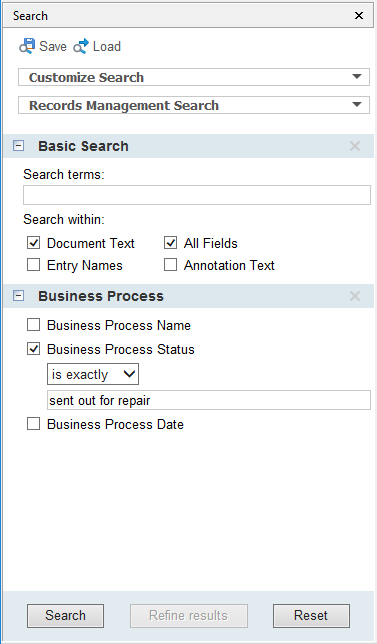 To keep the business process details up to date between the different tasks the users perform, and to allow specific searches in the Laserfiche Client based on the business process’s status, use the “Update Business Process” activity. 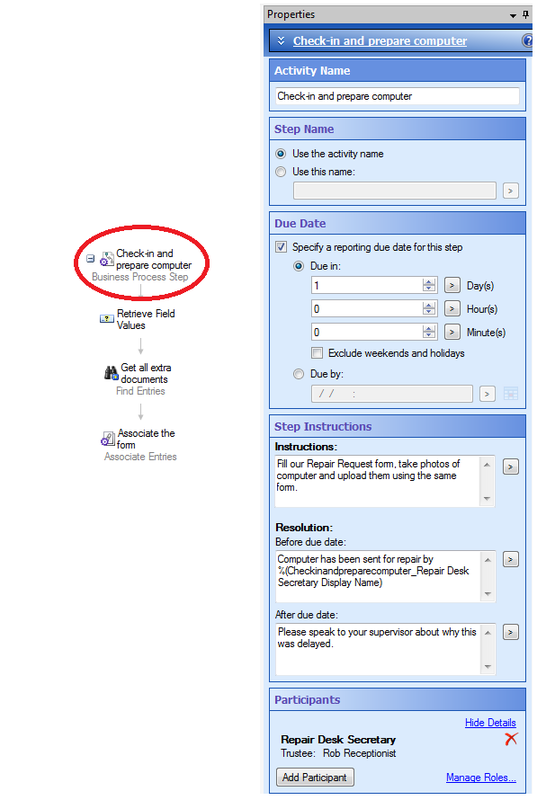 If the business process participant changes, as happens in the next “Review Received Computer” step when the quality control supervisor reviews the computer if the quality control specialist doesn’t do it by the due date, use the “Update Participant” activity. This allows Laserfiche Workflow to update the participant in a step for reporting purposes, notifications, and displaying instructions. Here we are also using the “Deadline” activity in order to reassign the quality control to the supervisor if the specialist doesn’t accomplish what he needs in the allotted time. 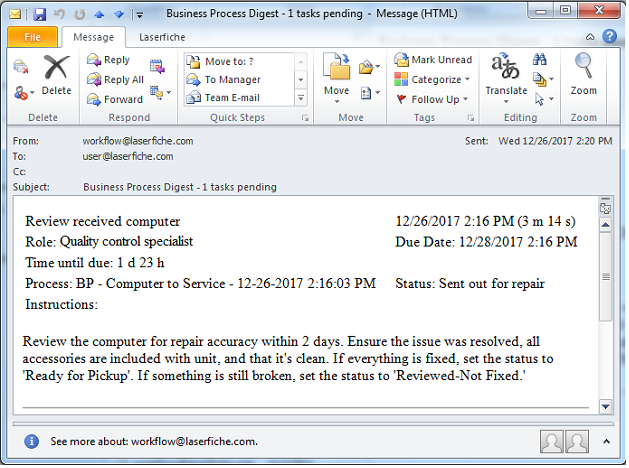 To send notification e-mails to the technician and the quality control specialist whenever they have work pending, the Laserfiche Workflow Notification System is used. 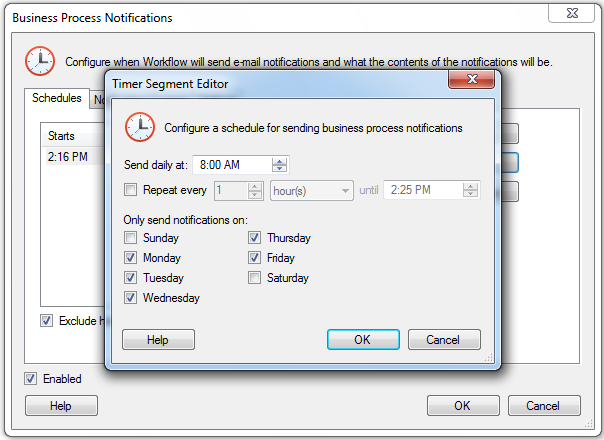 The timer in the Workflow Administration Console is configured to send one e-mail at 8am daily (not including weekends) with work to be completed. Users are provided with specific instructions for how to perform their particular tasks. Since employees regularly perform a large number and variety of tasks, this helps them remember what to do and reduces mistakes. 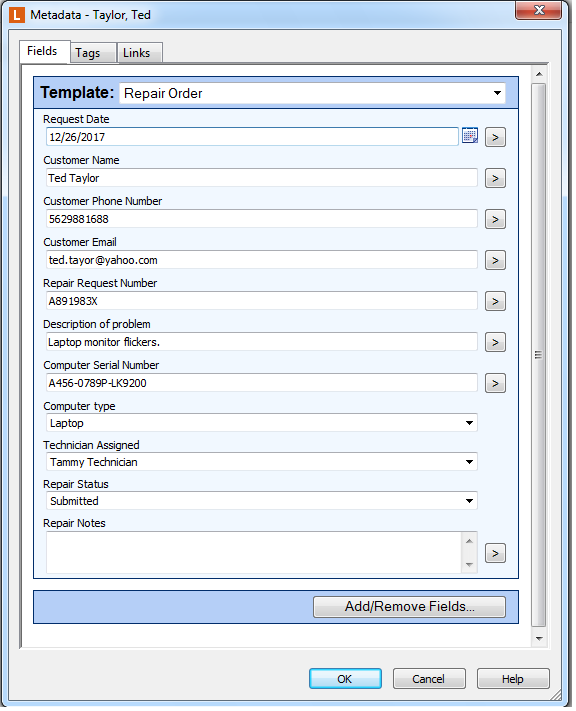 Business processes can be launched directly from within the Laserfiche Windows Client or Web Client, which means that tasks can be run on demand by regular employees. 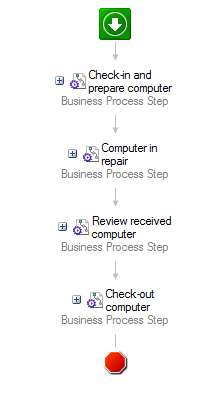 Managers are able to view how long each section of the business process took in the workflow instance details. They can locate delays and inefficiencies quickly in order to address issues as they arise.